My helicopter came in at 11.9 lbs including two 6s 5000 mah 65C Pulse batteries and one 2s 3600 mah Pulse receiver battery, completely ready to fly. This is not the lightest setup you could choose. Many owners are flying with a 12s 4000 mah setup. I am running the servos unregulated from the 2s lipo since all of the servos are rated up to 8.4 volts. I have since been running with two 6s 5300 mah 30C Gens Ace batteries with one 2s 2550 mah Pulse receiver pack. This further lightened the helicopter by saving over 1/4 of a pound. This puts the total weight to 11.6 lbs. I would like to begin by thanking Larry Haley and HeliDirect for giving me the opportunity to review this aircraft. The first thing you should know is that the kit was provided to me for free. I hope you will find that this did not sway my comments, as I would have purchased the model had it not been given to me. All electronic and batteries were purchased using my wife’s debit card though. We will keep that to ourselves. My goal is for you to find that this review is full of information, observations, tips and useful opinions. Luckily I have been in the hobby long enough now that I have gotten the chance to see several models being unwrapped, much to the dismay of my wonderful wife. The first impression was no doubt the really cool black box with bright green that demands attention. No doubt this was setting the stage for more to come. 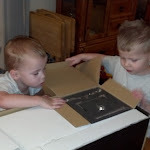 Upon opening the box I found about what I expected, several boxes packed neatly inside. The big surprise occurred when I began opening the boxes. Most manufacturers these days package their models in bags and boxes effectively using bubble wrap to keep everything safe. 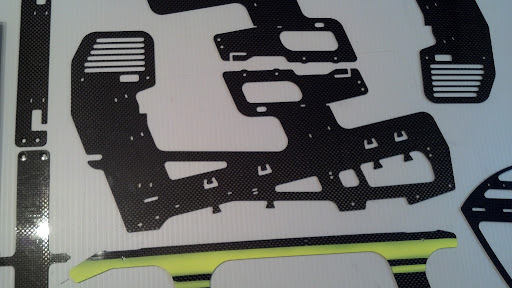 SAB decided to include foam trays that are cut specifically to hold each individual part. Each tray is also numbered. All of the additional hardware is in bags as you would expect. The added bonus is that SAB took the time to place each individual item in an individually wrapped and labeled bag, inside of an additional numbered bag. So this brings the question…why? We will turn our attention to the manual to answer that question. Just looking at the outside of the manual is another sign that you are dealing with a quality product. The manual is full, color thick pages. So if you end up with a little grease or oil on your hands the manual is not ruined. 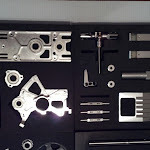 There are several parts in different stages that were completed before shipping. Not only is that nice, but they assure you that they used Loctite and grease where needed. There is not any need for disassembly of those parts. 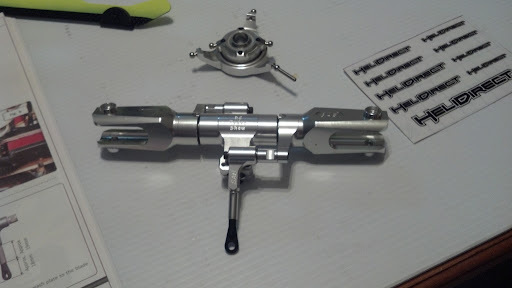 I decided to test that and pulled one of the preassembled bits apart. I found everything to be tight with plenty of Loctite to put my fears to rest. Many will probably decide to go ahead and disassemble everything for their assurance. For the review I thought it best to trust in their recommendations. 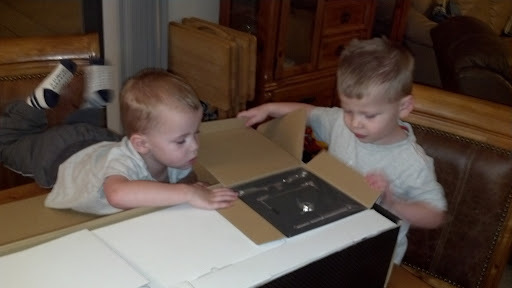 They do show you how to assemble the parts they had completed anyhow, for future maintenance. 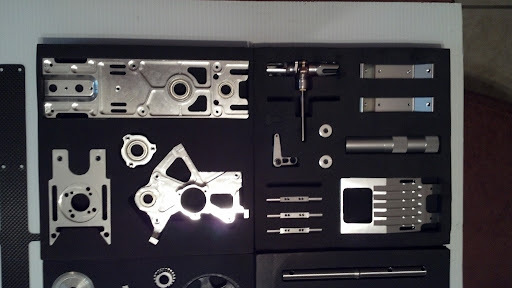 One of the things they preassembled was the bearings in the various parts throughout the kit. 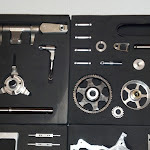 Very nice so you do not have to worry about getting thread lock in the bearings themselves. A nice touch is how they laid out the manual. When you arrive on a step, the manual tells you which bag and tray number you will need to complete that step. This really speeds up the build. What slows down the build is taking all of the parts out of those many bags. It would have been fun to count the total number of bags in the kit, but I would have lost count anyway. You will just have to take my word that there were tons. Link to the tips & tricks. 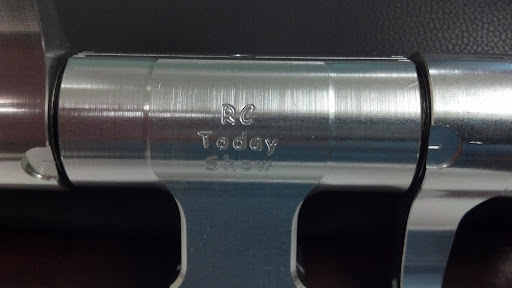 My day job consists of seeing various high end plastics and aluminum machined daily. As you can imagine that makes me pay close attention to the manufacturing of those materials. I was not disappointed by this kit. You can tell that the quality of the materials as well as the manufacturing was held to a high standard. I begin all of my builds pretty much the same way. Lay out everything neatly in the kit is step one. Step two is to try to force myself to read through the entire manual at least once prior to beginning the build. I think I made it through most, but my antsy fingers just couldn’t wait that long! It is a good idea to remove the burrs from edges of the carbon fiber. This will prevent damaging wires, o-rings and Velcro when they rub against the edges of the carbon. I got out my Dremel with a small round sanding cylinder. I proceeded to sand the edges of all of the carbon fiber parts. This part is not fun, but it is just so much easier to do before you begin assembly. I finished this with a small piece of sandpaper and needle file in the areas where the sanding drum could not reach. Be sure to wear long sleeves, gloves and a dust mask for this step. The next thing I did was to put a small amount of thin CA on a cotton swab and quick go over any edges of the carbon fiber that I thought may take some abuse. This includes the landing gear, battery tray and front of the frames. You can go as crazy with this as you like, but try not to put much on there. You may have to sand it off later if something mates to that part of the carbon fiber. Normally not an issue if you keep it super thin. My preference is just enough on the edge to see it wet. The reason for this is to ensure that there will not be any separation in the lamination of the carbon fiber layers. After that I jumped straight into the first steps of the manual. You begin by assembling the main frame and the landing gear. This is nice because in a very short time you can see it already looking like a heli. All of this was straightforward except one thing made me nervous. The landing gear carbon fiber supports are held on by screws. Two of the screws go into aluminum, but the other two screws tighten into the carbon fiber. For this step they recommend a little thin CA. Hesitantly I followed their instructions and found this to work perfectly. I placed a small amount of thin CA onto the tip of the screw. I then screwed it in a little at a time, then I would back it out partially. After that I would screw it in a little more, and just continue that process until the screw was fully engaged. The idea here is to use the screw as a forming tap. So as the CA hardens, the screw, or tap, is creating threads. Four screws, zero issues. The transmission is the next part of the assembly. It can be very intimidating upon first glance. The instructions made this go effortlessly. I was shocked to find that there were not any adjustments for gear mesh. Now that is faith in design and manufacturing. This is without a doubt the most intriguing power transfer system I have dealt with. 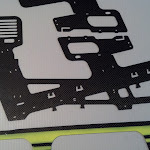 If you enjoyed legos or puzzles, hold on because you are going to really enjoy this part. All of this went very smooth, but take special care during the assembly when you place the spring (HC315) on the belt tensioner support. The spring has a bend on each end. One bend is offset more than the other, so take precaution to get this the correct direction. The manual doesn’t mention it, but it will be obvious if you try both directions. There are only two positions that the belt tensioner support can be mounted. When installed your pulley should be positioned OUTSIDE of the frame assembly. You need to be certain when you choose a motor that the motor shaft is at least 28.5 mm long. This will be important as that is the dimension that you need to cut the shaft length to. 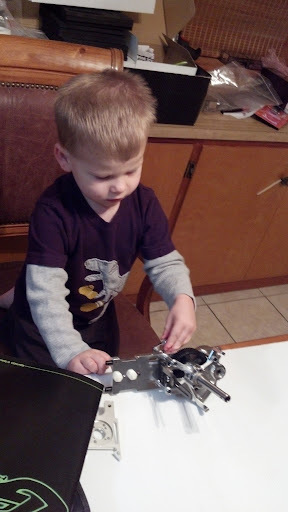 I accomplished this by first placing the motor inside a plastic storage bag and poking the shaft through the bottom. Then I cut the shaft off using Dremel with the cut off disc. I went ahead and used the cut off disc to also put a flat on the motor shaft for the set screw of the pulley. The storage bag keeps all of the metal particles away from the motor. The aluminum motor mount has two different bolt patterns. Both the Kontronik and the Quantum bolted right up without issue. The main rotor assembly went quickly as most was completed already. All that was needed was to screw the blade grip arm assembly to the blade grips and screw the balls onto the swash. Here you need to decide if you are going to fly sport or 3d. 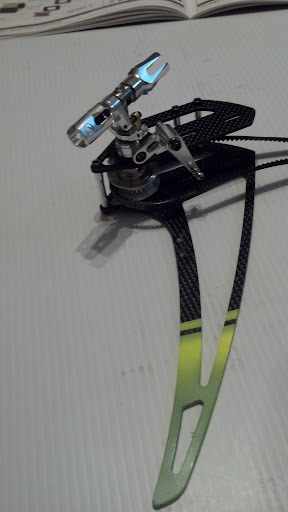 If you fly 3d you will want to be certain the washers are installed to tightened the head. If you fly sport you will want the washers removed so you can run lower head speeds. The assembly of the tail hub was very straightforward. Nice, clean and efficient would describe the design the best. Again, made easier by the fact that a lot was already done for me. Now for the other stunning aspect of this helicopter, the tail boom. It is without a doubt one of the reasons I knew one way or another that I would have this helicopter in my hangar eventually. 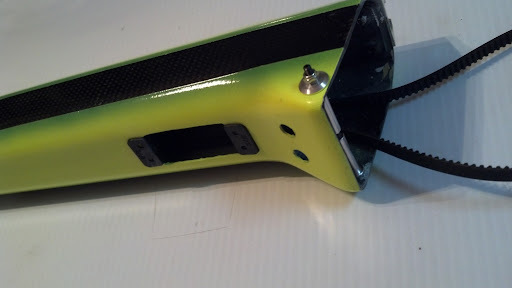 The tail boom is all hollow carbon fiber. Lighter and stronger than I would have guessed. This is another area in which some of the work is already done for you. This makes quick work out of the tail assembly. There are a few things to note though. The tail servo mounts under the tail boom. The boom is held on by two nylon bolts. In the event of a crash, the design allows for the nylon bolts to break and the tail boom to separate cleanly. I hope I do not have the opportunity to test this any time soon, but if I do I will be certain to let everyone know how that worked out! 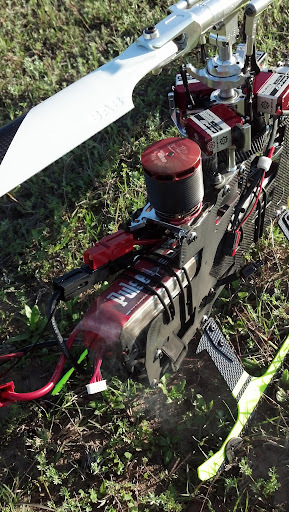 Take extra precaution to secure the servo wire to the inside, bottom of the tail boom. 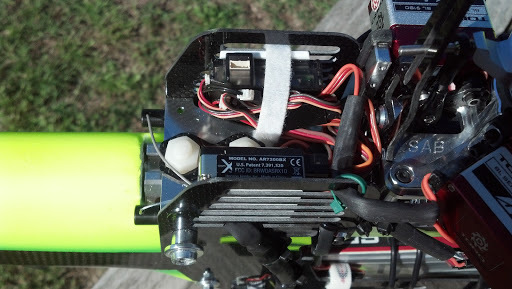 Should the servo wire come in contact with the belt drive it could result in an unanticipated pirouetting auto! Also take note to position the servo wire extension for the tail servo so that it will come unplugged in the event of tail boom separation. After you mount the servo and the tail section, the next thing is to make the linkage for the tail servo. I wasn’t exactly thrilled to hear that they wanted me to screw a steel rod into the center of carbon fiber tube. I decided to wrap the ends of the tube with Kevlar thread and thin CA. This should ensure that the carbon tube does not split. I haven’t heard any reports of this happening, just something that makes me feel better. 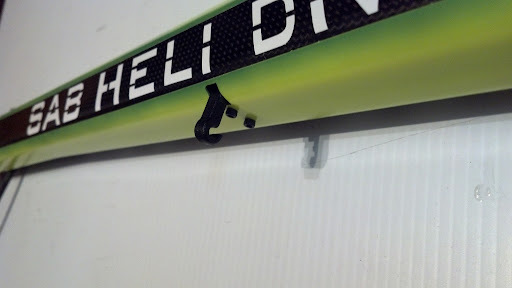 Once installed, my carbon rod would bind slightly in the tail linkage support (H0045-S). I used a round needle file to get the fit just as I wanted it. I did notice that after the first few flights I had some binding there again. Once more with the needle file and all was good. 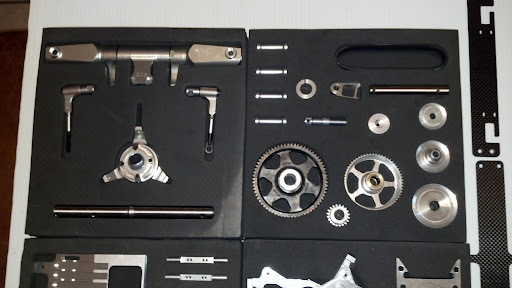 The machining on this kit is top notch. There is no doubt that strict tolerances must be held for this design to work. It seems that this was accomplished as my kit went together without issue. The only true imperfection I found was that the head of one of the set screws (M3x20mm) was not finished, so there was no place to put your hex driver. Luckily I was able to work around the issue since it was used in the front of the tail boom. I screwed it in by hand, then used green Loctite to secure it in permanently. I used hot glue to secure the servo wire to the bottom of the tail boom. Some are using different adhesives due to their wires coming loose over time. I decided to follow the instructions and just watch mine closely. So far it is still bonded well. Also on quite a few of the kits the tail boom does not have the glossy finish of the canopy. This didn’t bother me, but other consumers did not like the difference. Understandably SAB is trying to solve this problem. My feeling would be to send the booms to Canomod to have them painted along side the canopies, but I understand the added cost that would have to be passed along to the consumer. Either way I suspect they will work this out soon, if it hasn’t already been solved by the time this review is published. Now you are ready to begin assembly of the different modules. Electronic installation was easier on this heli than others I have done. One of the reasons is that this is the first time I have assembled a 700 sized heli. The larger heli naturally allows more room to place wires. Another reason is that SAB decided to mount the cyclic servos directly beneath the swash. This greatly minimizes linkage and setup. In addition they let you know to make the distance from the ball to the center of the servo between 16 to 18 mm. This takes any guesswork out of the equation. My servos went in without a problem. I decided to use the rubber spacers that came with the Torq servos, but not use the metal bushings. I found this to mount the servo extremely rigid, without any real movement in the servo. I used the factory servo arms that came with the servos. I was afraid they would allow too much flex, but so far have proven to be perfect. 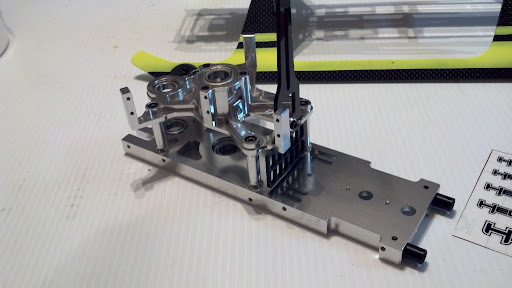 I don’t really prefer metal servo arms because I believe there needs to be flex somewhere or you are just asking for something to give where you do not want it to or just plain break. Be sure to install the balls and servo arms prior to installing the servos. You can access them later, but it is not as easy once installed. SAB does provide a hexagonal wrench with the kit that allows you to reach the servo horn screws when installed. The balls on the servo arms need to be directly under the swash balls. If they are not, use the supplied servo spacers to line them up. Be sure to lay the servo wire for the forward servo under the servo on the right. SAB shows in the manual how long to make each linkage. I got lucky as all of mine came out correctly, or maybe they are just that good. They have a tray for the ESC that also acts as a heat sink. This is nice as it helps keep it cool even though it is buried in the canopy. The canopy does have a cooling hole for it as well. Another reason this heli is easier to install the electronics in is because the manual shows you the recommended place for the electronics and the path for the wires. This was a big help for me since I normally spend hours staring at a heli trying to decide where to run the wires. SAB includes a receiver mounting plate that is optional. I have the AR7200BX mounted on one of the walls inside the frame, and the TM1000 telemetry unit mounted inside the other. So far it seems to be working well, although I was concerned that the unsupported wall may be too flexible for a flybarless unit. Once the electronics are installed it is time to install the tail boom. It is crucial that you put the belt on the correct direction. 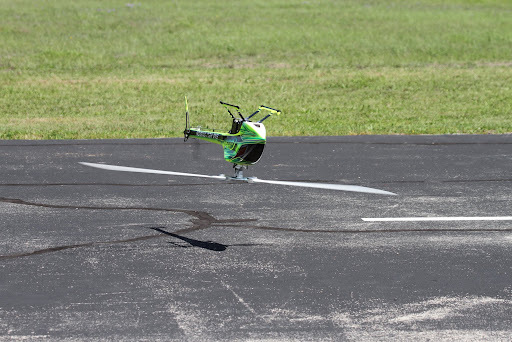 Just do a quick check by spinning the main rotor and verifying the rotation of the tail blades. It is surprising how “loose” the tail belt feels once installed. You will just have to trust me that it works. The canopy is another distinguishing aspect of the Goblin. It is very different as it wraps around the entire frame and blends into the lines of the tail boom. 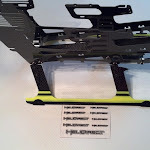 The kit comes with foam that has adhesive on one side that you use to place down the edge of the canopy. This stops vibration and protects the canopy, frame and tail boom. I put a little CA around the holes where the canopy screws go to help protect the paint. Normally that is a point that endures quite a bit of stress and abuse during flight and while installing and removing it. I felt like the build and assembly went very well. I cleaned the screws with rubbing alcohol, then used red Loctite Quick Stix 268 on the ones that went into metal. I placed the 2s 3600 mah receiver battery under the bottom of the battery tray. I put some Velcro on the combination and secured it additionally with a Velcro strap. 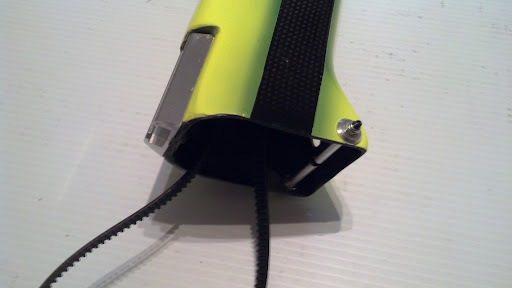 I used a minimum amount of Velcro on top of the battery tray and the bottom of the two 6s 5000 mah batteries. Just enough to stop the batteries from sliding. The 4 o-rings included in the kit will hold the batteries down without issue. My first flight went off without a problem. I set the AR7200BX up with all of the recommended settings, and in transmitter mode. The original setup had a Kontronik Pyro 700-52 motor that was very efficient. I put some grease on the gears to help break them in properly. For this reason my first two flights were at 1900 rpm. 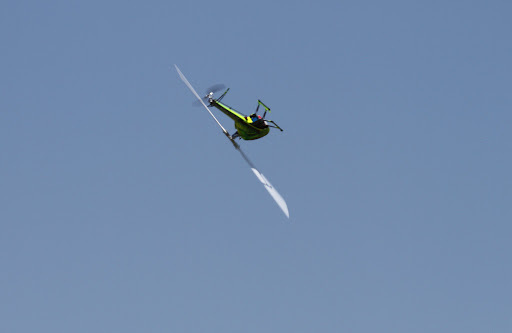 At this headspeed you can fly for 7 minutes with smooth aerobatics. The 22 tooth motor pulley works great for sport or 3d with around a 520 kv motor. SAB does offer a wide variety of pulleys from 16 to 26 teeth, just depending on your needs. They provide a helpful chart in the manual that will help you to identify the pulley you will want for your setup and style of flying. My initial setup had expo rates at 30% and the rates at 80%. I always begin new helicopter setups with very mild controls to keep everything slow and help diagnose any issues. The other reason is that I had not flown in several months, so I needed to shake the rust off of my fingers in order to feel comfortable at the sticks. The temperature of the motor was coming down around 120° and the Castle Creations Ice2 160 amp ESC was barely above ambient. 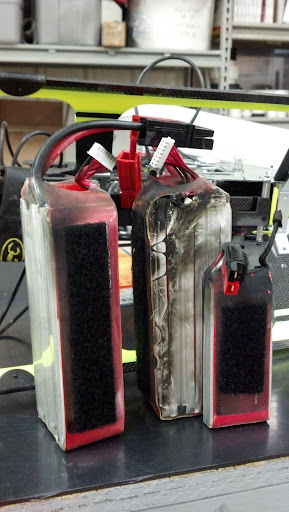 The 65C Pulse batteries were hardly warm. My plan was to get around five flights to break in the gears and belts properly, but plans are not always to come as planned. Since the first two flights went without issue, I was excited when I realized on my drive home on a Friday afternoon that the flags were hanging down without disturbance from the wind. I quickly grabbed the Goblin and headed to the nearby park to do some tuning of the Beast X on the first day without wind in over a week. Still at 1900 rpm I was surprised 30 seconds into the flight when I heard the motor shut off. I got the heli upright and had a nice autorotation to the ground without incident. Just as the skids hit the ground the implications of the possible causes entered my thoughts. I ran to the Goblin and got the canopy just about off when flames poured out of the canopy. I pulled the canopy off to see the flames coming from the ESC and over the two 6s 5000 mah batteries and the Kontronik motor. 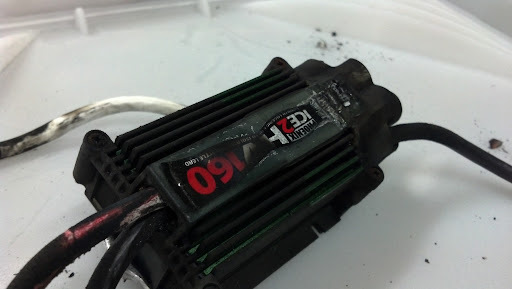 Unfortunately the Castle Creations ESC went up in flames without an apparent cause. Not including the ESC, the fire cost me a little over $700. 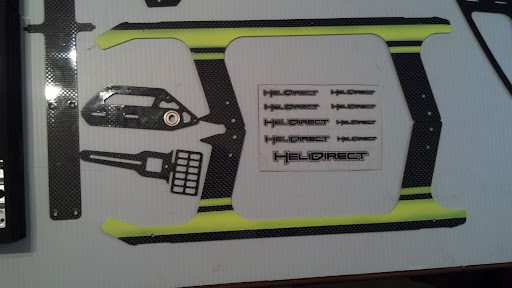 I sent the motor off to the manufacturer and purchased a Quantum motor from HeliDirect to replace it. I purchased 2 new 6s 5000 mah Pulse batteries and a new receiver battery. Finally I couldn’t decide exactly which ESC I wanted to try since I knew I would not be using another Castle. For the time being I am borrowing a Kontronik to do the high voltage duties until I can make my decision. 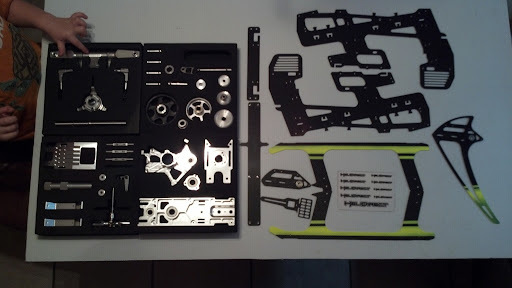 I then had to disassemble the frames and aluminum components to clean and polish to factory aesthetics. After replacing several burned wires and electronics I finally got the Goblin all broke in. I checked the tension of both belts and inspected the heli for anything that looked suspicious. I couldn’t find anything, so it was time to crank up the head speed and have some fun. At 2150 rpm the Goblin really comes to life. 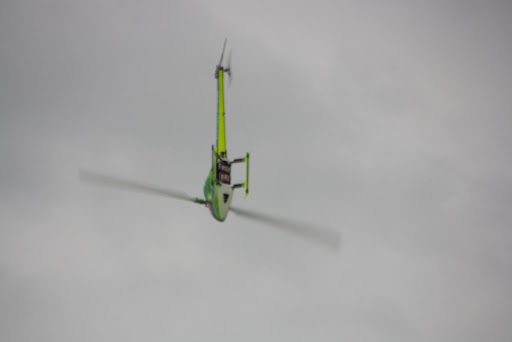 The heli has enough power to not only put a huge smile on the pilot, but to demand attention from observers in the crowd. The sound the Goblin makes is different than any I’ve ever heard. The majority of the people asked thought the sound was great, while a few replied that they would need time to adjust. Not that they disliked the sound, only that it is different enough that they were not 100% certain that something wasn’t wrong. The first thing to note is how aerodynamic the Goblin is compared to some of the helis in this class. SAB was able to keep the canopy narrow since there is not a large diameter main gear to deal with. This makes for some really fast flight without much effort. I had it clocked at 115 mph and I wasn’t confident enough to fly right at the guy holding the radar gun. So chances are it was moving around 130 mph. That was at 2150 rpm head. No doubt that with more practice and headspeed I could bump the numbers a bit. I currently have three headspeeds set up, 1950, 2100 and 2250. I also set up three rates. So after around 30 flights I have been playing with high speed flight using low rates, some 3D at high rates, and doing the majority of my flying at mid rates. I had several Pro pilots fly it to get their impressions. Two of them told me the my rates were just too soft for their liking, but it did make for some smooth flying. Must not have bothered them too badly because we could have landed and quickened it up in seconds. Lesson learned, that is partially why I decided to set up the three rates. Prior to flying the Goblin it was hard for me to conceive one helicopter being able to fly precision, sport and 3D with the same setup. After owning the Goblin I must say I will be looking for this in all of my future purchases. It looks and feels so graceful when you run a really low headspeed and just really manage the collective. Then you transition right into some fast flight and it looks like it just came to life. Makes me think of a Lamborghini in the air. Next thing you do it crank up the headspeed even more, throw it on high rates and just move the sticks as fast as you can. Holy crap. 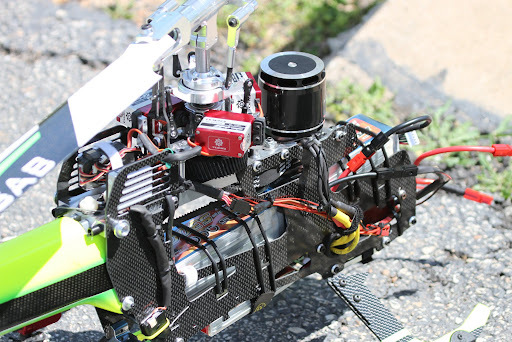 The Torq high voltage servos mounted on the Goblin just makes for one fast change of direction. One of the Pro pilots I had fly it was doing Tic Tocs so fast you could hard see it change direction. I couldn’t even comment. I mean…what could I have said that witnessing it couldn’t say for itself. 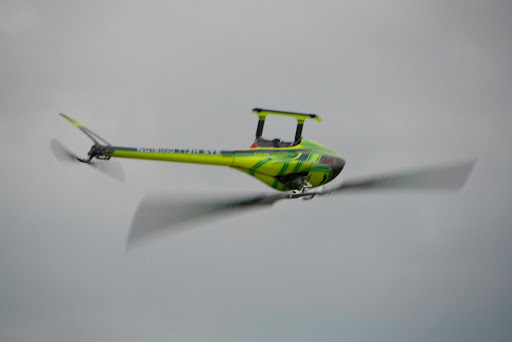 SAB’s decision to make the heli in only an electric flybarless version really shows the direction they believe the industry to be headed. I must admit that when some of the early pictures and videos of the Goblin were released I received very different opinions of what people thought about it. Some liked it, some thought it was interesting, while some just flat out thought it looked hideous. Well let me say that when people see this thing in person most are in love at first sight. 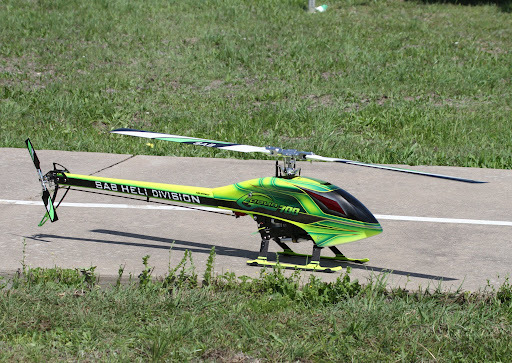 My helicopter has since made it to three different events. At every one it is the center of attention. It seems to demand attention. Why? Well it is not easy to pin it down to just one thing. It could possibly be the bright colors, but that has been done before. Maybe the wrapped canopy? No, that too has been done. The transmission is another possibility. 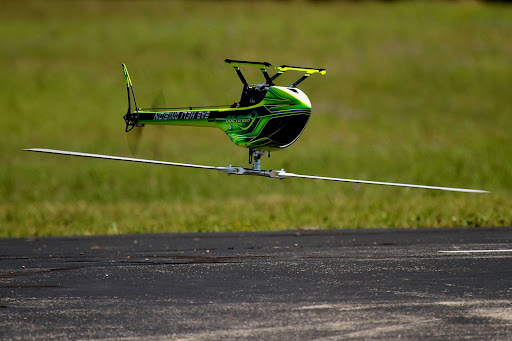 Or how about the carbon fiber hollow molded tail boom? If you only gave me one to choose, that may be it. My conclusion is simply that this combination is the most perfect package put together to date. SAB seemly started with a clean slate and without a doubt did not play copycat as is popular to do these days. I believe that their design utilizing the multi-stage transmission has several benefits for today’s extreme 3d pilot. The combination of the motor drive belt with the staged gear reduction result in a system that will likely all but eliminate stripping main gears as is so common these days among high power electric systems. 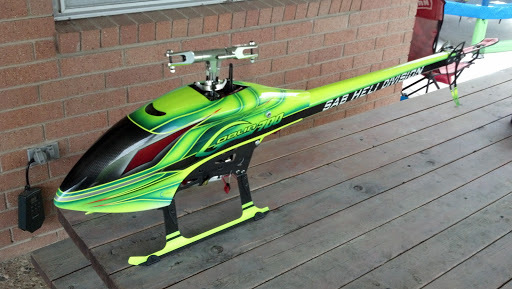 The kit comes with 690 mm main blades along with 115 mm tail blades that are specifically designed by SAB for the Goblin (notice the green on the blades). I did not test any other blades since I was so pleased with the ones that was provided in the kit. There is no doubt that with the incident I had with the Castle ESC catching on fire made me wish that the ESC had been mounted on top of the frame, rather than in the bottom. This would have saved me over $700 in loss due to the flames reaching other electronics. I cannot fault SAB for designing the helicopter to fly, rather than designed to burn with minimal damage. 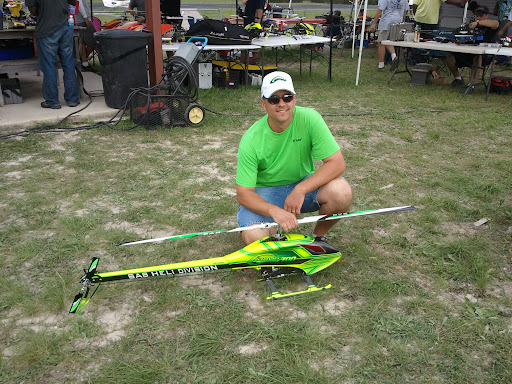 Shortly after my Goblin was broke in, Bert Kammerer released a video letting Goblin owners know to inspect the distance from the top of the tail boom to the bottom of the main blades. The distance should be at least 145 mm. Mine is 149 mm without any modification. Just something you should keep an eye out for. SAB has also changed the design of a couple pulleys. I did not have any issues with mine, but some were having one of the pulleys separate. I received the pulley with the new design and it should eliminate any possibility of failure. Just be sure to put thread lock on the screw (yes…I forgot at first). I think this fares well for SAB that they are proving to the industry that they are going to stand behind the product and continue to refine it. If it is your goal to get into a 700 sized helicopter as cheap as possible, this may not be the helicopter for you. Do keep in mind when pricing kits that this one does include the blades, so figure that in. 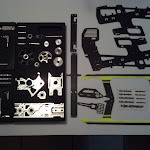 However if you can look to the quality of this machine along with realizing what you are getting, I have no doubt you will not be disappointed with the design, assembly, electronic installation, aesthetics and most important…the flying. I will continue to update this review as I get more and more flights on it. I will let you know what is showing signs of wear, and what breaks. Now that I have owned, serviced and flown the Goblin for a while I wanted to update everyone on how things have went. Lets start with the not so great. Since my kit was from the 2nd release there were some things that were later fixed. One of them is the aluminum canopy knobs. I have lost numerous ones in flight, despite trying several different methods of curing the issue. Nothing seemed to work for long. Also my canopy developed some damage around the hole eventually enlarging and cracking. SAB began including a rubber grommet (HA111-S) that fits on the canopy not only to protect it, but to better hold the canopy screws in place. I have had a couple of people tell me that this does protect the canopy better, but still doesn’t completely solve the canopy knobs coming loose. 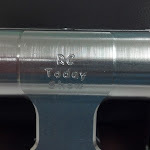 My solution was to manufacture some from plastic that allow a better cinch when tightened. One time during a flight while letting James Kovach test it out, one of the bolts broke that I found out had later been changed for one with a shoulder. Luckily James was able to auto rotate it down without incident and a fellow IRCHA attendee had a spare. The replacement is (HC033-S) in case you are not certain you have the correct one. 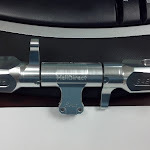 Shortly after receiving my kit HeliDirect sent me a new 37 tooth front tail pulley (H0101-S). Not only does this spin the tail blades a little faster, but is manufactured differently due to issues with the original. SAB also began making the 20 tooth drive pinion out of steel rather than aluminum. This was strictly to increase wear resistance. They changed the tail pulley to incorporate their new stronger design as well. I have chosen to stick with my original and am just keeping an eye on it. So far no issues. 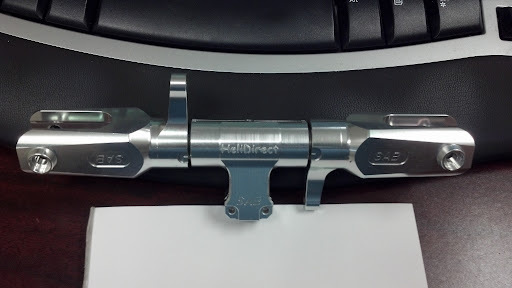 The last change I know of was a new M4 locking collar (H0121-S) and matching main shaft (H0122-S) that accepts it. I’m actually not sure what the exact reason was for this. I do know they say that this is not a necessary set to replace. I commend SAB on acknowledging that some things could be better, taking the proper steps to improve those things, then finally to publicly inform everyone of the changes and updated parts. There are several manufactures that will deny a particular issue placing the blame on their customer. SAB has proven that even though they are new to designing and selling helicopters, they are will to stand by their design and refine without hesitation. I’m also impressed how they have made several “how to” videos as well as downloadable pdf on maintenance tips. Okay, with all of that out of the way let me talk about the good. How about the fact that since my incident with the fire the helicopter has basically went untouched. What I mean to say is that this thing requires very little maintenance, and just works without problems. All of the bearings are perfect. The gears show very little signs of wear. Both belts are the originals and have not needed any attention. I do follow Bert’s recommendation of putting a little grease on the gears every so often. It does make just a little mess, but doesn’t bother me. I have really just fell in love with the sound the Goblin makes. Between that and the sleek looks it is without a doubt my favorite helicopter. Which begs the question: How can I be unbiased in this review. Of course the truth is obvious. When there is a helicopter that you love, anything that is not perfect just seems unimportant. At IRCHA James talked me into letting him fly the Goblin with a single 6s 5000 mah battery. Reluctantly I let him do it, which ended up being one of my favorite things to do since. By putting a single 6s pack in, my headspeed is right around 1150 rpm and flies remarkably well. Amazingly you can fly it around for over 8 minutes and squeeze close to 10 if you want to push it. It has been reported that the DFC head is not allowing some to run those low head speeds. I don’t know why mine works so well, but no wobble anywhere from 1150 rpm all the way to 2350 which is the max I have flown at. Make sure you are ready if you decide to fly your Goblin 700 at 2350 rpm. Wow…I mean…WOW. Bert has a video on the SAB website talking about making sure that your head is set up correctly. Please be certain to watch this even if you are not having issues. This should prevent any unfortunate incidents before they appear. 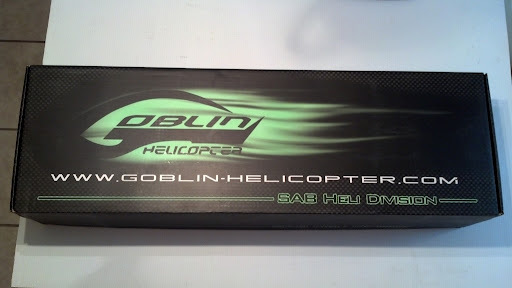 After owning mine for a while SAB released the Goblin 630. It shares a lot of parts with the 700, but has enough differences to make them unique. I’m not going to take the time in this review to go into it all. What I really want to say is that I have had the opportunity to fly a couple of them now and can really understand why people are loving them. I would say if you are looking for a 600 sized stick banging sickly overpowered machine…then look no farther. SAB designed it for those guys that want to crank the headspeed through the roof and have the heli stand up to the punishment. A good friend Kenny Sierra lent me a Kontronik Heli Jive 120 to get this review model in the air while I waited for Castle to send me a replacement. During my time with his ESC I did something I thought would never happen. 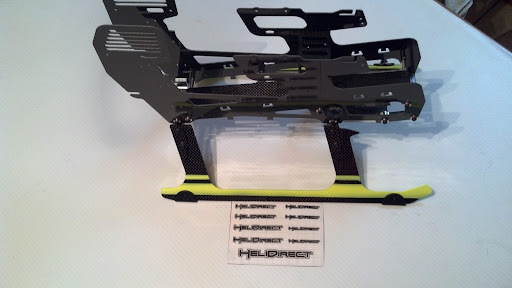 The Heli Jive worked so well I went to HeliDirect and purchased a $560 ESC. Man am I crazy. Here is the deal though…it works. What I mean is…it just works. These days while many pilots are hunting for the perfect governor through flybarless units. Kontronik says that there is no reason because they do it perfectly right through the ESC. All you must do is be willing to pay for it! I will continue to update this review in the future if I feel something needs to be added. This model continues to impress me and I cannot foresee anything changing. 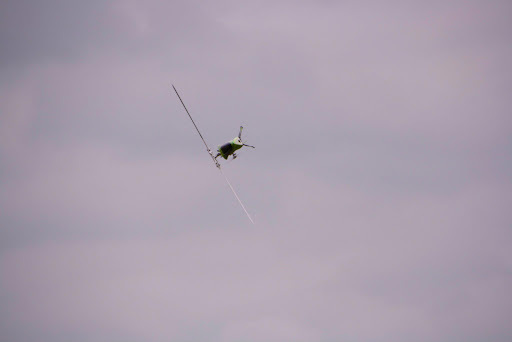 The ability of the Goblin 700 to fly slow, fast, hard, soft, precision and smack are just mind boggling. That combined with the aggressive and fast looks that are much more easily visible at all orientations just further my appreciation of the design. 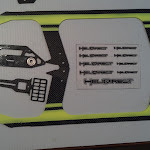 Thank you SAB for designing a fantastic machine, and thank you HeliDirect for the opportunity to do this review.